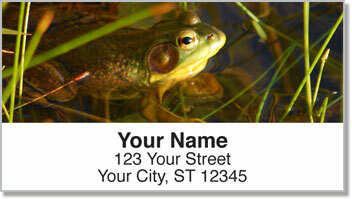 Original photography featuring big bellowing bullfrogs take us down to the pond for a hopping good time! There are more than 5,000 kinds of frogs around the world in many shapes and sizes. Some are colorfully exotic species found in the treetops of the rainforest, but what we have here is the good old-fashioned American bullfrog. 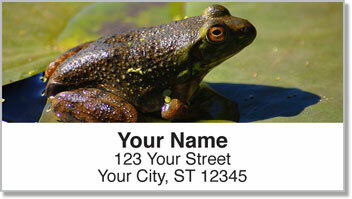 Frog Address Labels from CheckAdvantage will remind you of being a kid and wading through lily pads trying to catch a croaker of your own. 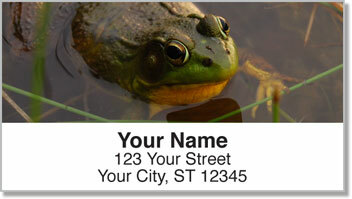 They'll also give your outgoing mail a refreshingly natural look while saving you a ton of time. No more writing your return address by hand, just stick it on every envelope using labels with a convenient self-adhesive backing! 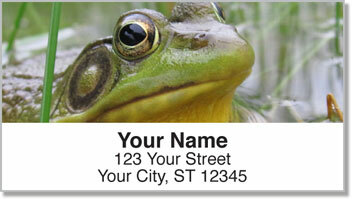 Get your very own Frog Address Labels today!